[AUG 9-10 | FRISCO, TX] It was fitting that, in the 1st annual playing of the Elites Cup Invitation, the best players in the south couldn’t produce a champion in just 36 holes, as both the Boys and Girls divisions champions came down to sudden death playoffs late in the afternoon on the Fazio Course at Stonebriar Country Club. In the boys division, two upcoming seniors – Trophy Club’s David Harrison and Pottsboro’s Austyn Reily – battled it out in a playoff after finishing atop the leaderboard at even par. Both boys hit the fairway on the downhill par-4 1st hole, and when Harrison, who is committed to play at UT San Antonio, hit his approach shot to about 12 feet, Reily faced a pressure-packed moment to answer. And answer he did, knocking his wedge to inside 6 feet. When Harrison’s bid for birdie burned the edge, Reily calmly stepped up and rolled his birdie putt in, clinching the victory, his first major win on the TJGT this year. Both young men needed impressive Round 2 performances even to get into a playoff. Harrison, who struggled in Round 1 on the greens en-route to a 4-over 76, shot the low round of the tournament on Day 2, a four-under 68. The Byron Nelson standout made 8 birdies and four bogeys in his round, and was three under in his final six holes to set the pace at even par for the rest of the field. Reily had his own highs and lows in the final round, matching three bogeys with 5 birdies, and needing two birdies in his lat three holes to join Harrison in the playoff. After the first day, three players were tied at 1-under par and in the lead – recent Match Play champion Palmer McSpadden, Mexico’s Mauricio Cavazos, and CEC-Bayou Elite champion Cameron Hubbard. Hubbard finished T3, tying with Allen’s Christian Castillo; Cavazos finished in solo 5th, and McSpadden finished T7. In the girls division, upcoming senior Aysis Azarcon faced off against youthful phenom Avery Zweig in a three-hole playoff to decide the championship. 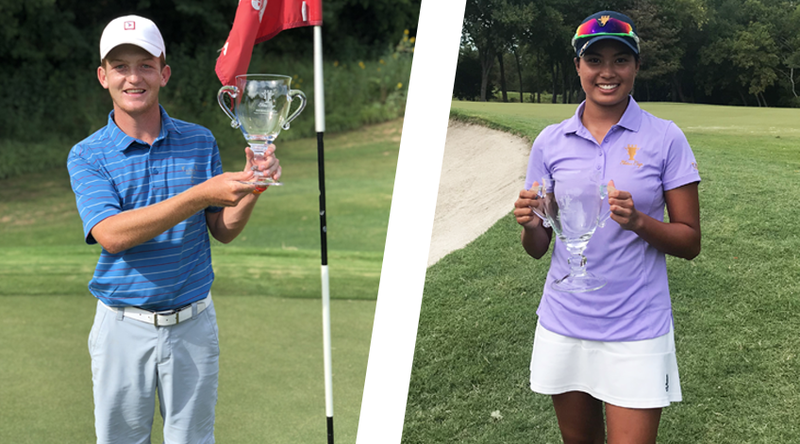 Both young ladies traded pars on the first two holes, each narrowly missing chances to close things out, but on the third hole, a long par 5, Azarcon holed her birdie putt after Zweig narrowly missed, capturing the title in the girls division. Azarcon came out blazing in Round 1, firing a 2-under 70 (the lowest round of the day) and taking command of the leaderboard. She struggled a bit on her first 9 holes, making three bogeys, but played her final 9 bogey-free, adding four birdies for good measure, including a final birdie on the par 5 18th hole to get to 2-under for the day. After her opening 73, Zweig found herself in solo third, three shots back of Azarcon. She turned it on during the second round, however, firing a 3-under 69 to vault up the leadboard and tie at the top. Zweig started quickly, birdying her first two holes of the day, and finished strong as well, making birdies on the 16th and 18th holes to tie for the lead. Rounding out the top 4 were Baylor University signee Amelia McKee and Southlake Carroll junior Stephanie Lee.